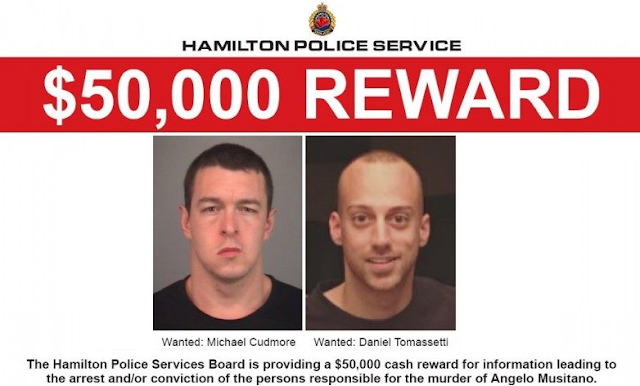 Cops are offering a $50,000 cash reward for information leading to the arrest of two suspects in the murder of mob scion Angelo Musitano. Musitano, 39, was gunned down in the driveway of his home on May 2, 2017. Detectives said the Musitano homicide was linked to the March 14, 2017 murder of Mila Barberi and the attempted murder of her mob connected boyfriend Saverio Serrano. Jabril Abdalla was arrested. Canada-wide arrest warrants were issued for the arrests of Michael Graham Cudmore and Daniel Mario Tomassetti. Michael Cudmore flew to Cancun in May 2017 and Daniel Tomassetti in January 2018. Neither has been seen nor heard from since.